A new type of sleep tracker may be hitting the market soon. But you don’t wear this tracker on your wrist or place it on your bedside table. Instead, you wear this sleep tracker like you would a pair of pajamas. 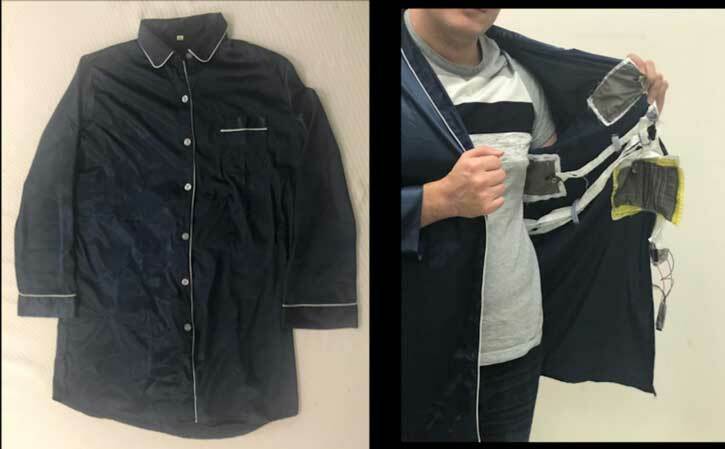 Researchers at the University of Massachusetts, Amherst recently unveiled the “Phyjama,” smart pajamas outfitted with sensors to measure heart rate, breathing, and other biometrics. Trisha L. Andrew, Ph.D., assistant professor in chemistry at UMassAmherst, and her team presented their design at the American Chemical Society Spring 2019 National Meeting & Exposition. We spoke with Andrew, head of the team behind the creation of the Phyjama. She explained the technology used in the creation of the Phyjama and how these smart pajamas can even measure our sleeping position. At first, the Phyjama set looks like a standard pajama shirt. But inside, the shirt contains five sensors located within the fabric that are designed to measure heart rate, respiration rate, and sleep position. The sensors are both triboelectric and piezoelectric, according to a release from the American Chemical Society. Here’s what that means in layperson’s terms: The Phyjama’s one triboelectric sensor monitors for quick pressure changes and can detect the wearer’s heart rate. The four piezoelectric sensors monitor constant pressure and can determine the wearer’s sleeping position. Using a process called “reactive vapor deposition,” the researchers say they are able to coat the sensors directly on fabric patches for a flush design. These fabric patches are then connected by silver-plated nylon threads and run into a printed circuit board. The gathered data is sent out via Bluetooth. Andrew said research into Sudden Infant Death Syndrome (SIDS) helped her team realize how important it was to monitor for sleeping position. According to the American Academy of Pediatrics, more than 3,500 infants die per year in connection to SIDS. The organization recommends that, until their first birthday, infants sleep only on their back. “We started thinking about sleep posture partly because of Sudden Infant Death Syndrome, where the colloquial knowledge is that you place infants to sleep ‘face up to wake up,’” she said. In addition to sleep position monitoring capabilities, Andrew told us that she and her team plan to add another patch to the pajama pants. This will be meant to measure back strain.